I need you all to help me. I’m making a public commitment: I will work on novel revisions, and I will keep working on them until I have entirely rewritten this book, and then written it again if I need to. I will acknowledge that work and life will sometimes derail this process, and pick it up again as soon as I can. I will make this the best book that I can, and a book I want to read. It’s okay if it is slow, but I still need to do it. I will post irregular updates here. Kick me if I get too far off-track? 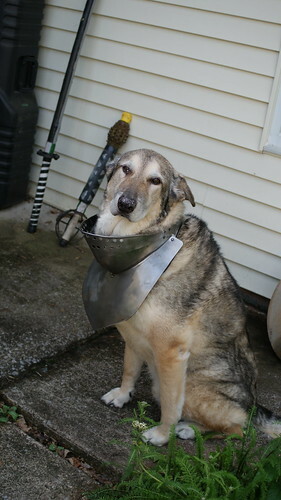 Entirely unrelated: dog in armor! He’s a good, good boy. Grendel likes wearing clothes, and armor too apparently. He has no dignity, and loves to be the center of attention. I’m prone to the new shiny. I’m also prone to work on the urgent rather than the long-term, and there’s been a lot of urgent lately. Plus I may be a bit overcommitted. But I do want to do this thing, and I’m sure there’s some way to wedge it in.